Six former and 21 current SP Hunters players have been named in the 50 man SP Hunters train - on squad. Former captain Israel Eliab who spent a year with London Broncos in the United Kingdom, Willie Minoga with Townsville Blackhawks in the ISC, Stanton Albert with Penrith Panthers have been recalled into the train-on squad after their contracts were not renewed. 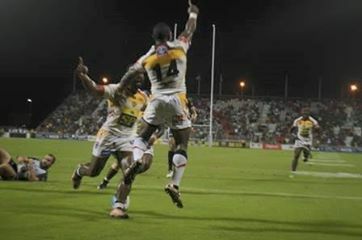 Lae Snax Tigers duo David Loko and Noel Joel were included following an impressive season with the 2016 Digicel Cup premiers. The other is Lawrence Tu’u who was omitted in 2016 due to visa issues. Wellington Albert has also been included in the train on squad after being released by the Penrith Panthers. The 21 current Hunters players from the 26 man squad of 2016 to vie for a spot in the final 30 man squad are: Adex Wera, Sailas Gahuna, Noel Zeming, Edward Goma, Brandy Peter, Ismael Balkawa, Stargroth Amean, Bland Abavu, Nixon Borana, Enoch Maki, Wartovo Puara Jnr, Henry Wan, Esau Siune, Ase Boas, Warren Glare, Watson Boas, William Aquila, Philemon Kimisive, Tuvi Lepan, Benjamin Hetra and Butler Morris. Three current players will play overseas next season. They are Justin Olam (Melbourne Storm), Thompson Teteh (Redcliffe Dolphins) and Timothy Lomai (Burleigh Bears) while Atte Bina Wabo and Adam Korave have been omitted. Seventeen players come from the Digicel Cup competition with one from the Southern Confederate. SP Hunters coach Michel Marum said the squad will assemble in Port Moresby on December 4, 2016 to start a grueling pre-season training program for three weeks. “We are six weeks behind our pre-season schedule,” he said. “It will be 13 weeks to March 4 when the 2017 ISC season kicks off and the selected training squad will expect a tough pre- season,” Marum said. “If you are not up to it, you will be dropped,” he added. The first week starting on December 4 will be in Port Moresby followed by another week at the LNG site at Hides. The final week of training will be held in Goroka. The camps end on December 24, 2016 and the players will travel home to spend Christmas with their families. Staff to assist Marum during the pre-season camps are: Nigel Hukula, Solomon Kuluniasi, Toua Kohu, Roger Laka, Leonard Tarum, Stanley Tepend, Stanley Hondina, Andrew Vitliu, Dr Gideon Kendino and Joe Bruno. “The final 30 man SP Hunters squad and coaching staff to participate in the 2017 Queensland Intrust Super Cup will be named in early January,” Marum said.